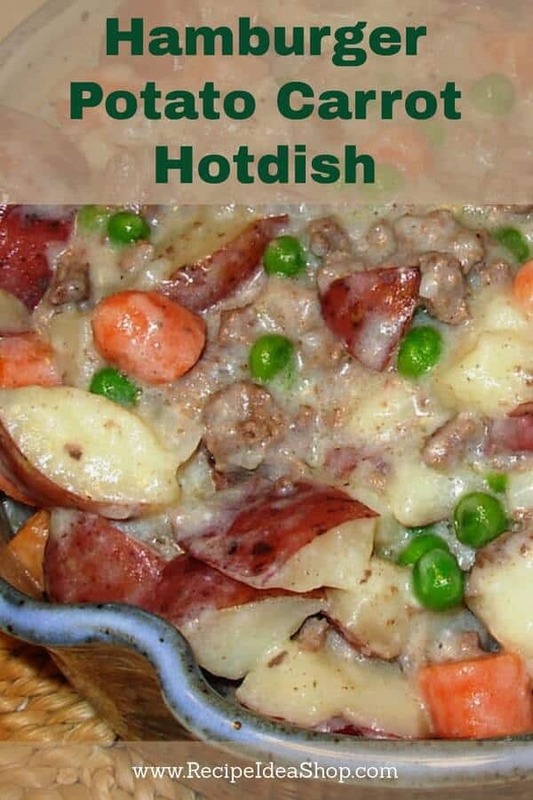 Hamburger Potato Carrot Hotdish is a hearty stew with a milk gravy base. So tasty and filling. Hi. It’s Lois in the kitchen at Recipe Idea Shop, talking about Hamburger Potato Carrot Hotdish. Since it has turned colder here in Virginia—and Thanksgiving is behind us—I say it’s time for some comfort food from my childhood! The name—like many of the concoctions my mother made—does not have a creative name. Mom always named her recipes simply by the names of the foods included. 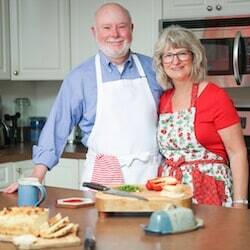 This recipe was always a favorite of mine as a child, and my children liked it too. 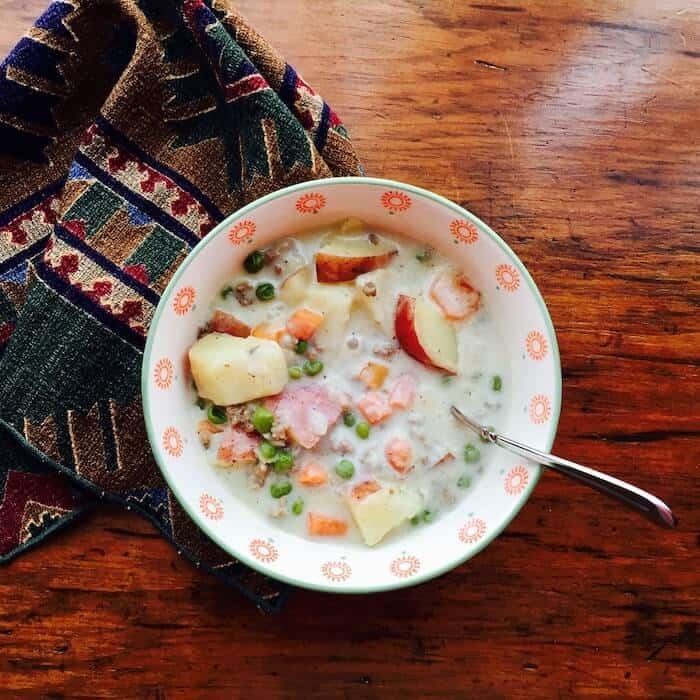 It is a thick stew that is best served in a bowl. I have taken it to potluck dinners, and everyone always likes it. My mom made it with canned potatoes and canned carrots, but I like it better when these ingredients are cooked fresh. I prefer my carrots cooked a bit crisp, not mushy the way canned carrots can be. It has a milk gravy base and is OH! So tasty. Hamburger Potato Carrot Hotdish is high in fat due to the hamburger and milk fat. Of course, you can lower the fat content by using ground turkey and low-fat milk. 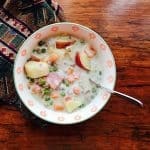 It pairs nicely with a Green Salad and a piece of fruit, which would likely entice you to eat a smaller amount of Hamburger Potato Carrot Hotdish, saving you some calories and reducing the fat, too. The serving size listed is about 1-1/2 cups. Le Creuset 7 1/2 Quart Dutch Oven. Buy yours on Amazon today. 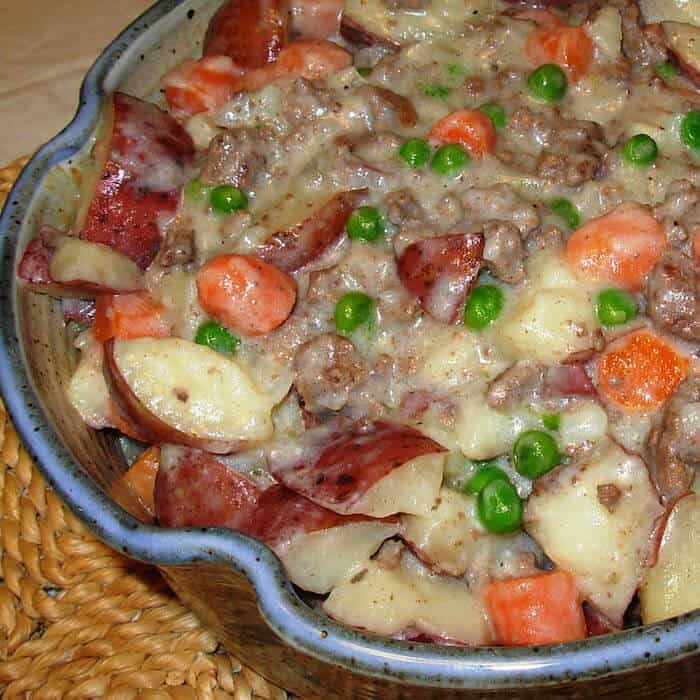 A hearty stew with a milk gravy base, this Hamburger, Potato, Carrot Hotdish is a good potluck dish. Steam the potatoes and carrots until crisp-tender. In a Dutch oven sauté the onion in the olive (or canola) oil until the onions are transparent. Add the hamburger and continue cooking until the meat is brown all the way through. Using a slotted spoon, remove the hamburger/onion combination to a separate bowl. Dispose of the meat drippings (or use them instead of the butter in the next step). Add the butter to the Dutch oven (no need to clean the pan first) and melt it over medium heat. Stir in the flour, making a roux. Slowly add the milk until the flour/butter mixture is dissolved. Add the cooked hamburger, onion, carrots, peas (if using) and potatoes. 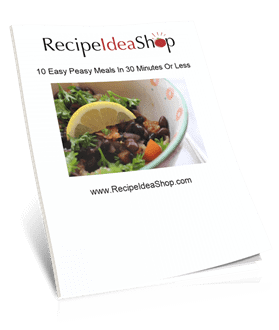 Note: Many of the links included throughout Recipe Idea Shop are affiliate links, which means if you follow them and you buy something, we will get a small commission. It doesn’t cost you a penny more, and you can still use your Amazon Prime (Shop Amazon — Give the Gift of Amazon Prime) account to buy. This posting includes affiliate links.. Don and I love our Amazon Prime account. 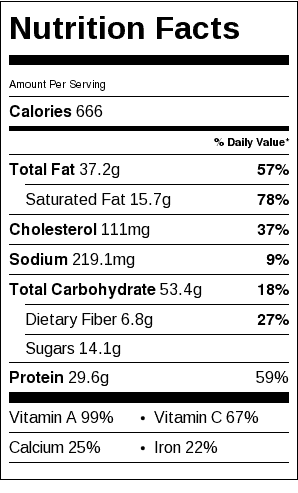 Hamburger, Potato, Carrot Hotdish Nutrition Label. Each serving is about 1 & 1/2 cups.